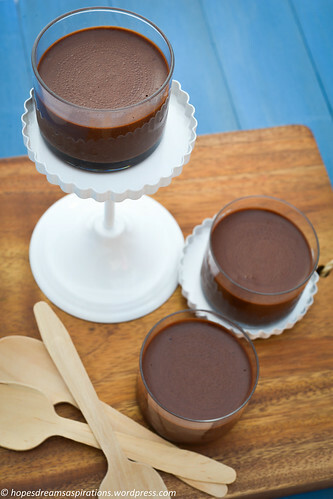 This chocolate mousse recipe was adapted from Nigella Lawson’s Instant Chocolate Mousse. 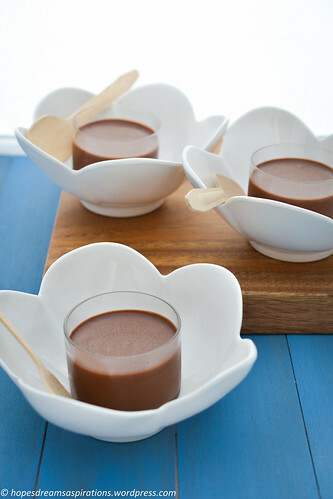 I’ve found that I need a higher cream to chocolate ratio for a more pourable mixture, resulting in a silky smooth mousse. This is really quite indulgent and melt-in-your-mouth. What I like about this recipe is there is not much waiting time and is fairly easy to do. It also doesn’t involve raw eggs, hence I wrote ‘child-friendly’ in the title. It is certainly NOT quite healthy as there are large quantities of cream and chocolate involved, so I suggest you make your portions really small. With vessel availability and fridge space in mind, I divided this recipe up into 10 serves. I even went halfs with my daughter! Remember, the better quality chocolate you use, the better the experience! 1. Put the mini marshmallows, butter, chocolate and water in a heavy-based saucepan. 2. 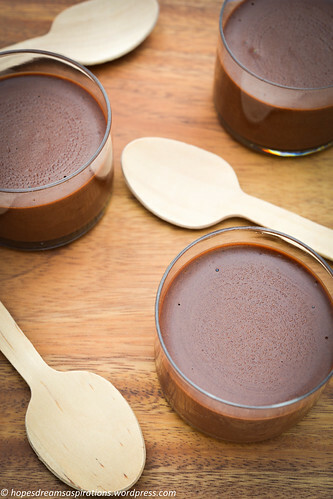 Put the saucepan over gentle heat to melt the contents, stirring to make sure nothing sticks to the pan (the chocolate can stick very quickly). Remove from the heat to cool. You can put the pan in a larger vessel containing cold water to speed up the cooling process. 3. Meanwhile, beat the cream with the vanilla paste until thick, and then fold into the cooling chocolate mixture until you have a smooth, cohesive mixture. 4. 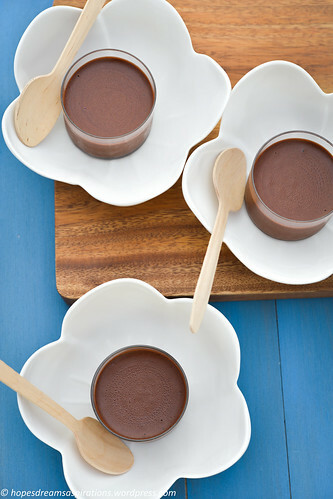 Pour into 10 small glasses or ramekins, and chill until set (takes only about 20 minutes for it to set).